I love cranberries! I remember years ago my Mom and I took a trip to Nantucket during harvest season and saw the bogs and ate everything cranberry. We even grabbed a few from the bog and ate them. Not only are they delicious they’re good for you! For Thanksgiving (in addition to the Caprese Platter, Potato Bites and Kalamata olive crostini) I brought this as a dessert. Wow-what a taste!! Slightly tart from the cranberry and lemon, slightly sweet from the sugar-but just right all around. I added a bit more cranberries and lemon zest than the original recipe from http://www.southernpinklemonade.com/. I didn’t take a photo of the dish. It was late on Thanksgiving and it looked so good that I totally forgot all about the photo. But let me explain: they’re nice squares with crust on the bottom, a layer of cranberries and then crust dotted on top. Preheat oven to 375. Line a 9×13 baking dish with parchment paper (i put little pieces of tape on all 4 sides to keep it in place-but don’t forget to remove them before you put it in the oven!!) leaving a bit of an overhang to grab and remove the contents out of the pan after baking. In the bowl of a food processor add the flour, baking powder, sugar, salt and lemon zest. Pulse to combine. Add the butter and pulse until dough is crumbled into small pieces. Move the dough into the bowl of a stand mixer and mix in the egg and vanilla extract. Add water 1 tbsp at a time until dough comes together. Press half of the dough into the bottom of the baking dish. Keep the remainder handy to use for the topping. In a medium bowl combine the sugar and cornstarch then add the cranberries and lemon juice and stir to coat cranberries evenly. Port the contents of the bowl evenly over the crust in the baking dish and sprinkle with the zest. Crumble the remaining dough over the top of the cranberries. Bake for 30-35 minutes until the top and sides are brown. Remove from the oven and allow to cool completely (I put the baking dish outside on a cooling rack as it was chilly and it cooled quickly). Once cooled lift the entire contents out of the dish using the parchment paper ends, cut into squares and serve. 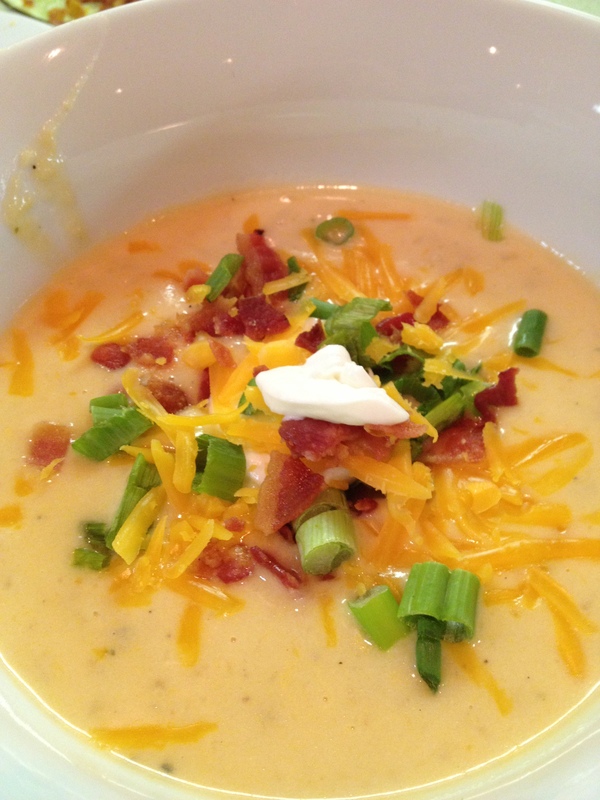 The really chilly weather is here and I’ve been looking for a great potato soup recipe. I came across Pink Parsley’s recipe and adjusted it a bit to lessen the calories and also more to my taste. I used light cream and light cheese. It came out so well and even better-it’s lighter! Below is my version. This soup is FABULOUS!!! It’s really easy to make and you can adjust the toppings to whatever you’d like. Make it SOON!! You’ll be happy you did! Place 2 tbsp bacon grease in a large skillet over medium heat. Add the onion and saute until browned. Then add the garlic, thyme, 1/4 tsp salt and 1/2 tsp pepper. Cook, stirring, for about 2 minutes until everything becomes fragrant. Then stir in the flour, stir it constantly for a minute or so until the flour is no longer white. Then stir in one cup of the chicken broth, scraping up the bits on the bottom of the pan, until the mixture has thickened. Then pour it into the slow cooker. 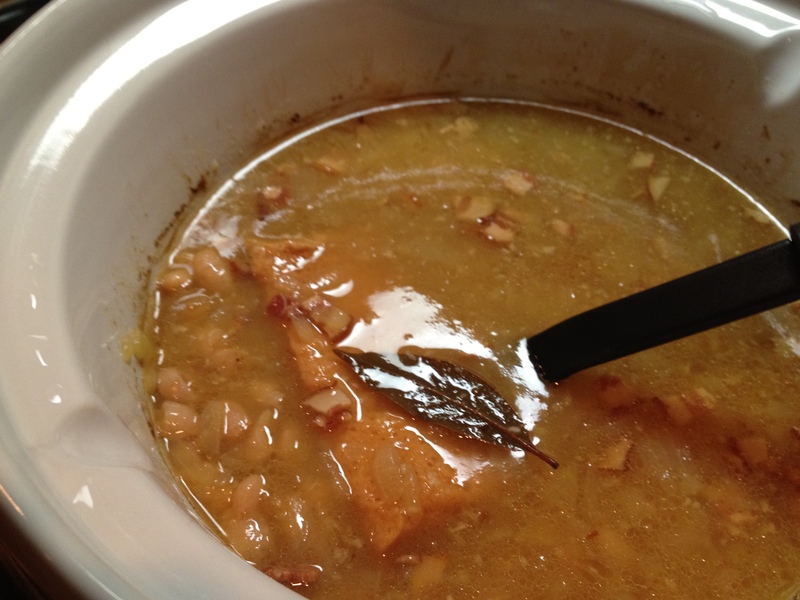 To the slow cooker add the remaining 3 cups chicken broth, all of the potatoes, 3/4 tsp salt, 1/2 tsp pepper. Cover and cook on low for 5 hours. After 5 hours test a piece of potato to make sure it’s cooked through. If not cook it for a bit longer, until they’re to desired texture. When the potatoes are done cooking place 3 cups (without liquid) into a bowl, add the light cream, and mash until smooth. Add them back into the slow cooker, stir in the sour cream and cheddar cheese. Cook for another 10 minutes or until the cheese is melty and has come together. You can cook the bacon for the topping during the last 10 minutes. 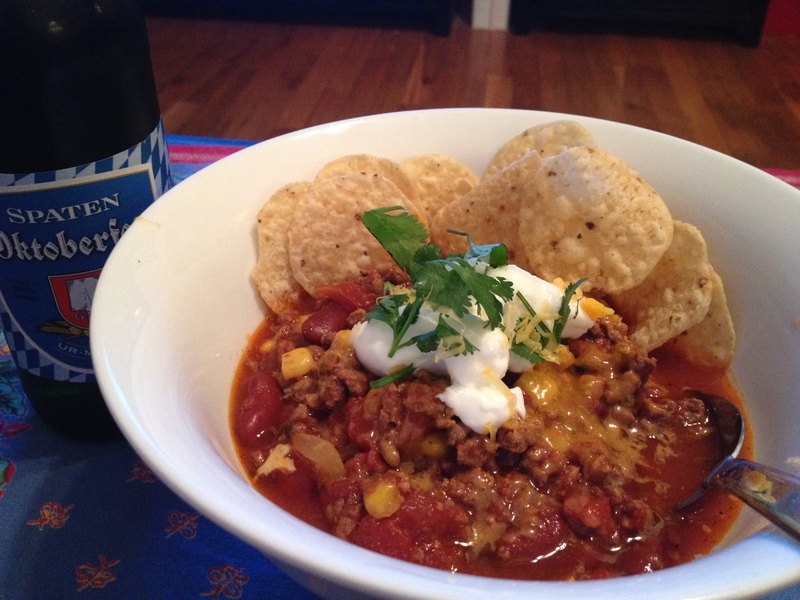 Serve hot topped with sour cream, grated cheese, scallions and bacon bits or anything else you’d like on top. Other topping ideas: crispy pancetta, a squirt of Dijon mustard, chives, creme fraiche–whatever you like! This is another dish that I brought to my Mom’s for Thanksgiving (with the Kalamata Olive and Sun-Dried Tomato Crostini). 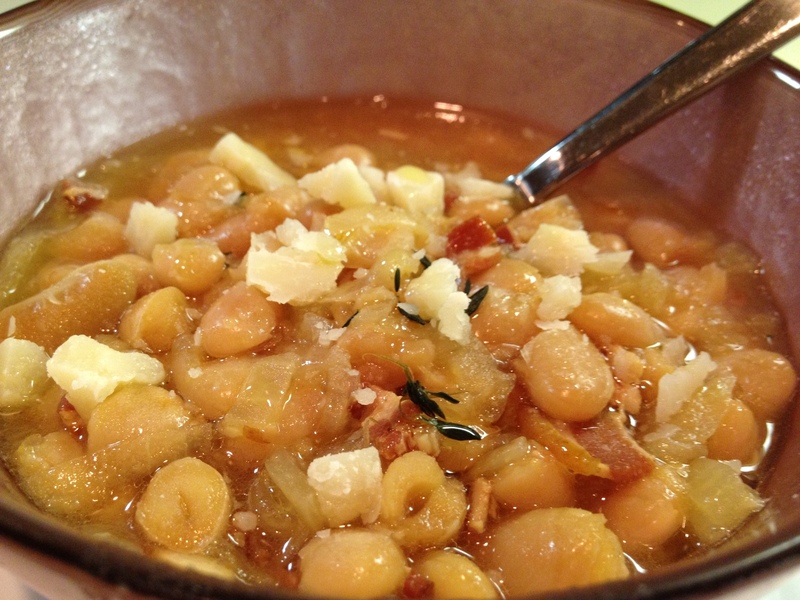 This can be served as an app or an accompanyment to the main dish. 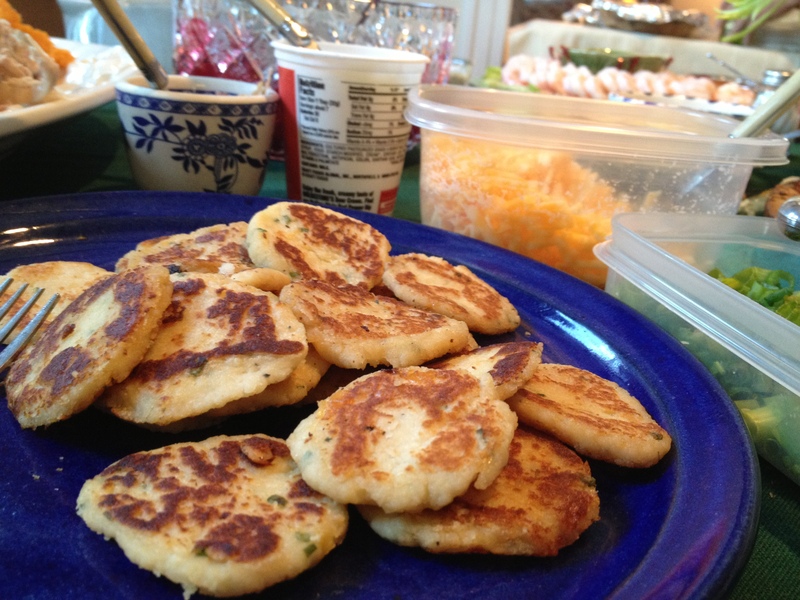 Since we did a buffet-style I set these out for dinner like a make-your-own with the potato cakes on one plate and bacon pieces, shredded cheese, sour cream and chopped scallions for people to top their own. The cakes were very easy to make and they were delicious. I made them at home on Thanksgiving morning then let them cool on paper towels and then brought them to my Mom’s and reheated in a baking dish in the oven. I didn’t have time to fancy up the plate as people had already started eating, but you get the idea below with the plate of cakes and toppings around it in the background. The cakes came out to be about 2 inches wide and 1/2 inch thick. The recipe made about 25 give or take a few. 2/3 cup Colby Jack cheese, grated. Do NOT use pre-grated. 3/4 cup colby-jack cheese, grated. Do NOT use pre-grated. In a large bowl mix all ingredients for the Potato Cakes above (including the ingredients for the potato packet) until well incorporated. Heat a large skillet over medium heat, spray with cooking spray, take about a walnut-sized bit of the potato mixture, roll it into a ball and flatten it evenly. Place in pan. Repeat until there are a few in the pan-but you’ll have room to flip them over. Cook on both sides, place on paper towels to cool OR on a plate in the oven to keep warm at a low temperature. Repeat until all of the cakes are cooked. 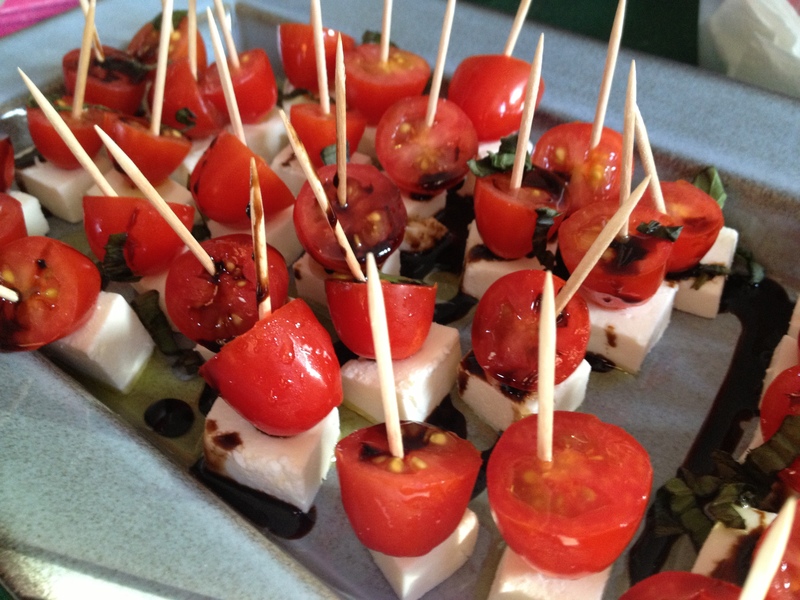 Serve them warm either topped or not and let your guests top them as they like. So Thanksgiving has come and gone. For this year my Mom (who always hosts it and does a great job) thought it would be fun to do more of a buffet with everyone bringing a few dishes in addition to a turkey and reguar side dishes. It worked out so well. I brought a few apps and a dessert. Everything came out great!! These were SO easy to make and everyone loved them. The olives and tomatoes spread over a thin layer of the cheeses were just enough. I opted to use a package of small toasts but you could easily use thin slices of french bread too, just dry it out in the oven for a while first. Since I was making other dishes using the toasts saved me a lot of time and they were the perfect 2 bite size. In a bowl combine the feta and cream cheese. Place garlic, olives and tomatoes in the bowl of a food processor and pulse until the desired consistancy is reached. 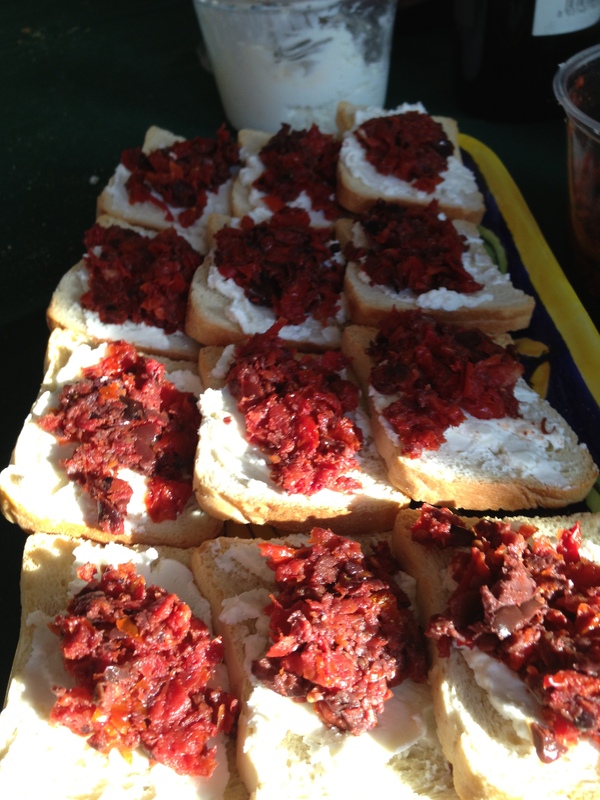 Right before serving spread a thin layer of the cheese on a toast and spoon a bit of the olive/tomato mixture on top. Repeat with as many as you want to serve. Helpful hints: have the cheese spread at room temp-it’s much easier to spread that way. Make up only as many as will be eaten in a short time as over time the cheese does make the bread a little soft. I made both the cheese mix and olive mix the day before and kept it in the fridge overnight. 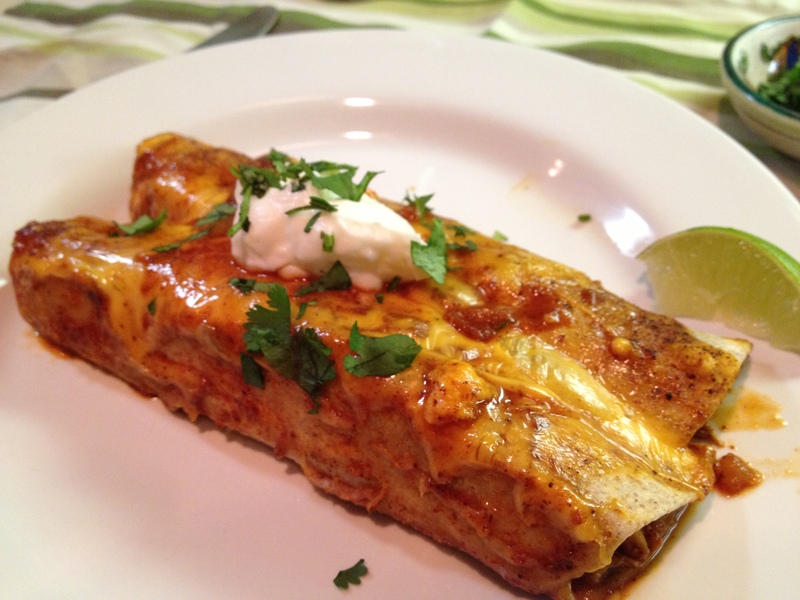 I’ve made many chicken enchilada recipies over the years. I found this one on the Cook’s Illustrated website and decided to give it a try. The flavor was great. The recipe stated that it made 12 enchiladas but I ended up with only 10. I’ve adapted it to my own taste. Make sure that the cooked chicken is finely shredded, or the edges of large pieces will tear through the tortillas. 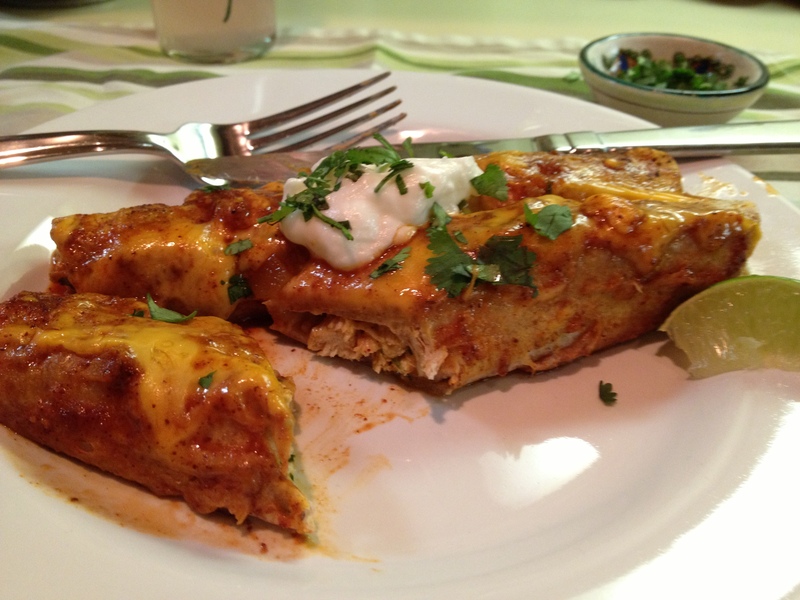 Serve these enchiladas with lime wedges, low-fat sour cream, sliced avocado, shredded lettuce, and hot sauce. 1. Adjust an oven rack to the middle position and heat the oven to 400 degrees. Combine the onion, oil, and 1/2 teaspoon salt in a large saucepan. Cover and cook over medium-low heat, stirring often, until the onions have softened, 8 to 10 minutes. Stir in the garlic, chili powder, cumin, and sugar, and cook until fragrant, about 30 seconds. Stir in the tomato sauce and water, bring to a simmer, and cook until slightly thickened, about 5 minutes. 2. Nestle the chicken into the sauce. Reduce the heat to low, cover, and cook until the chicken is no longer pink in the center, and the thickest part registers 160 degrees on an instant-read thermometer, 10 to 12 minutes. Transfer the chicken to a plate; set aside to cool. Strain the sauce through a medium-mesh strainer into a medium bowl, pressing on the onions to extract as much liquid as possible. Season the sauce with salt and pepper to taste. 3. Once the chicken is cool enough to handle, shred into bite-sized pieces. Toss together the shredded chicken, 1/2 cup of the enchilada sauce, 1 cup of the cheddar, the jalapeños, and cilantro, and season with salt and pepper to taste. 5. Lightly spray the tops of the enchiladas with vegetable oil spray. Pour 1 cup of the remaining sauce over the enchiladas to coat them thoroughly. Sprinkle the remaining 1 cup cheddar down the center of the enchiladas. Cover the baking dish with foil and bake until the enchiladas are heated through, 20 to 25 minutes. 6. Remove the foil and continue to bake until the cheese browns, about 5 minutes longer. Serve, passing the remaining 1 cup sauce and the lime wedges separately. What yummy little bites!! The coating on these bites are a combination of buttery Ritz Crackers, walnuts and panko so they’re tasty and crispy. The honey mustard sauce is tangy, sweet and has a touch of heat. All around they’re delicious. They’re really easy to make and came together in about 30 minutes-start to finish. In a ziplock bag large enough to hold all chicken and marinade add all marinade ingredients and let it sit while you prepare the breading and honey mustard sauce. Place crushed Ritz Crackers (a potato masher or food processor works well), walnuts and panko into a bowl. Place eggs in a 2nd bowl. Place flour in a 3rd bowl. Line them up in assembly line fashion: flour, eggs, breadcrumbs. 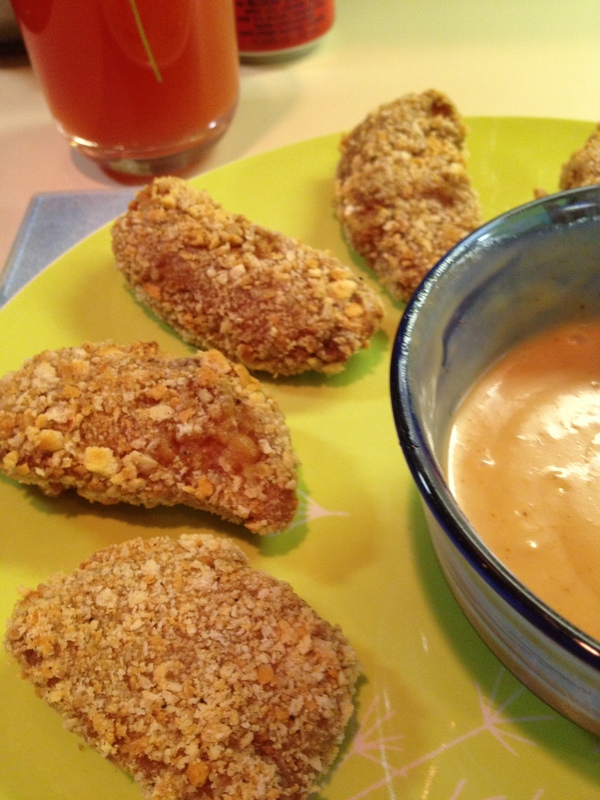 Roll chicken pieces through flour, then egg, then breadcrumbs and arrange on a cookie sheet. Bake in the oven for about 15-18 minutes (depending on how thick the pieces are) until done, flipping once during baking. Serve with the dipping sauce. They’d also be great with Thai Sweet Chili Sauce, BBQ sauce or some ranch dressing with hot sauce. Slightly adapted from Mary Ellen’s recipe. What a fun name!! This lasagna uses a basic marinara sauce and small meatballs instead of a meat sauce. Those along with fresh mozzarella and grated parmesan-it’s a winner. Also it came out pretty light compared to most other lasagnas. 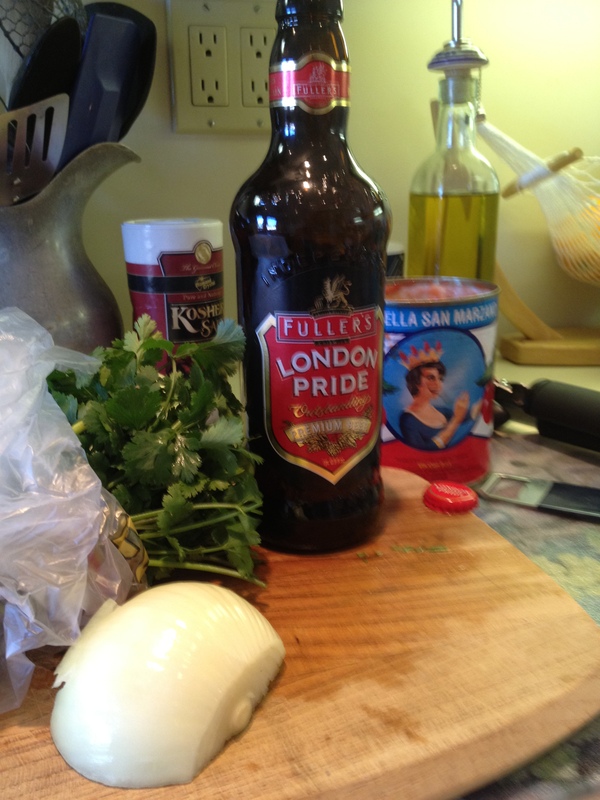 Usually when there’s no ricotta a bechamel sauce is used-this one doesn’t have that-perhaps that’s why. It was delicious. Do not substitute no-boil noodles for the traditional noodles here; they will not work in this dish. The size of the noodles varies by brand; if the noodles are short (such as DeCecco) you will layer them crosswise in the dish, but if they are long (such as Barilla and Ronzoni) you will layer them lengthwise in the dish. Regardless of which brand of noodle you are using, there should be 3 noodles per layer. 6 ounces Parmesan cheese or Pecorino Romano cheese, freshly grated (3 cups). Don’t use pre-grated. 1 pound fresh whole-milk mozzarella cheese, shredded (4 cups). Do not use pre-shredded. 1. Adjust an oven rack to the middle position and heat the oven to 450 degrees. Spray a large rimmed baking sheet with vegetable oil spray. Mix the beef, 1 cup of the cheese, bread crumbs, eggs, 5 tablespoons of the basil, 1 teaspoon salt, and 1/2 teaspoon pepper together in a large bowl using your hands until uniform. 2. Pinch off grape-size pieces of the mixture, roll them into small meatballs, and arrange on the prepared baking sheet. Bake the meatballs until just cooked through and lightly browned, 8 to 10 minutes. 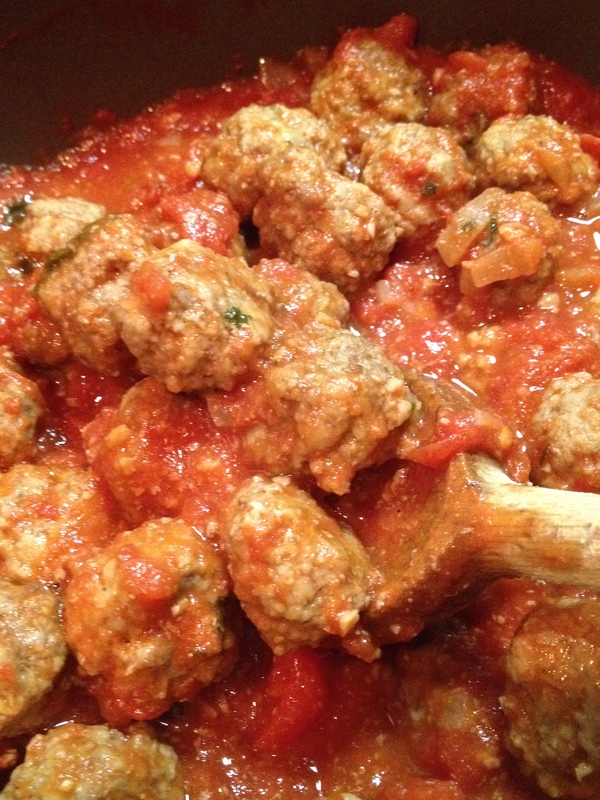 Transfer the meatballs to a paper towel–lined platter and set aside. Reduce the oven to 400 degrees. 3. Meanwhile, heat the oil, onion and garlic in a medium saucepan over medium heat until the garlic starts to sizzle, about 2 minutes. Stir in the tomatoes and simmer until the sauce thickens slightly, 10 to 15 minutes. Off the heat, stir in the remaining 3 tablespoons basil and season with salt and pepper to taste. Stir in the meatballs and cover to keep warm. 5. Spray a 13 by 9-inch baking dish with vegetable oil spray. Smear 3 tablespoons of the tomato sauce (without any meatballs) over the bottom of the pan. Layer 3 noodles into the pan; the noodles can touch but not overlap. Spread about 11/2 cups of the tomato sauce with meatballs evenly over the noodles. Sprinkle evenly with 1 cup of the mozzarella and 1/2 cup of the Parmesan. 6. 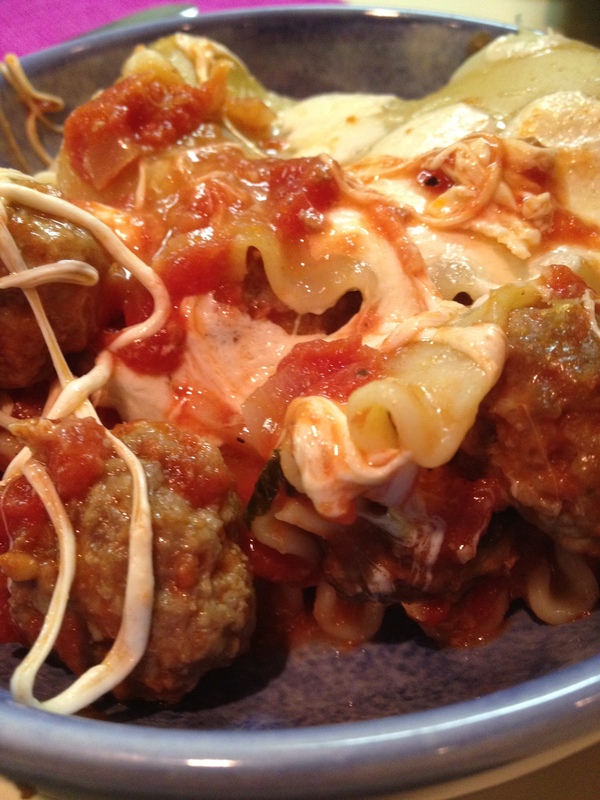 Repeat the layering of noodles, tomato sauce with meatballs, and cheeses twice more. For the final layer, cover the noodles with the remaining 1 cup mozzarella and sprinkle with the remaining 1/2 cup Parmesan. 7. Bake until the filling is bubbling and the cheese is spotty brown, 20 to 25 minutes. Let the lasagna cool for 10 minutes before serving. TO MAKE AHEADThe lasagna can be assembled through step 5, then covered with plastic wrap and refrigerated for up to 2 days. Remove the plastic wrap and cover the lasagna tightly with aluminum foil that has been sprayed with vegetable oil spray (or use nonstick foil). Bake the lasagna covered for 10 minutes, then remove the foil and continue to bake as directed in step 6.Here’s the meatballs in the sauce.